So Elsecar in deepest greenest Barnsley is probably not the first place you’d think of to get over a second cancelled trip to Ibiza thanks to that pesky ash cloud, but South Yorkshire’s a fair distance from the seaside and me and industrial heritage, we’ve got previous form. Just 15 miles outside Sheffield, Elsecar is the former heart of Barnsley’s coalfields, set in a lush green valley, and steeped in folklore, not least thanks to the nearby villages where Kes was filmed. I am going in search of some fine British pop art at Elsecar’s Hive Gallery in the form of a new Patrick Caulfield show. The Hive Gallery, it turns out, is a boutique art space tucked away in Elsecar’s handsome Heritage Centre, home to all manner of indie delights. A compact white cube, the pure paintbox vibrancy of Caulfield’s prints hits me as soon as I set foot inside the space. Caulfield, a Royal Academician, was one of Britain’s pop art pioneers, renowned for his graphical style and playful way with paint. The twenty-two prints on show, ‘Some poems of Jules Laforgue’ are inspired by a series of French poet Jules Laforgue’s poems and have been called Caulfield’s ‘graphic masterpiece’. As soon as I get closer, I see exactly why. The prints are colourful still lifes, close-ups of everyday life – scarves, railings and lamps – with jaunty titles that add an emotional dimension. The relationship between the print names, the poems and the prints themselves add another layer to the story: ‘She’ll have forgotten her scarf’, ‘Ah storm clouds rushed from the Channel coasts’ and my particular favourite, ‘You’ll be sick if you spend all your time indoors’. Caulfield has a special knack for making inanimate subjects like interiors and outdoor furniture human and affecting. He didn’t like the title ‘pop artist’ and his work is certainly tinged with more melancholy compared to contemporaries like Peter Blake and David Hockney. In these twenty-two beautiful screenprints, inspired by twelve poems, everyday life soars, charged emotional moments are framed in time. All the works are for sale, numbered and signed by Caufield and reasonably priced they are too. I think they’re supremely collectable, and if you were as bowled over as I was, you might come away with something very special to have and to hold. 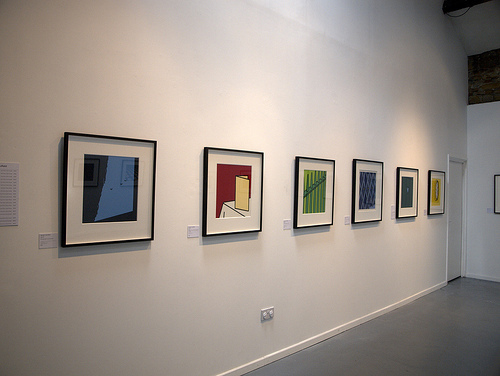 ‘Some poems of Jules Laforgue’, a series of twenty-two prints by Patrick Caulfield, is now showing at The Hive Gallery in Elsecar until 13 June.